Commercial Construction - jasonhardee.com is Jason Hardee's construction page. We have designed and built many restaurant and fine dining establishments. Most of these are unique to their design, whether it be a franchise specific style or an individual’s dream that is not only expressed in the food they serve, but the atmosphere that is created in the building design itself. 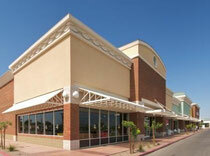 Most shopping and retail centers are not very appealing to look at. By recognizing this, we design our buildings so that the signs are not the only attracting features. We also consider sun direction and use shading features if necessary to eliminate glare without compromising curb appeal. Every medical office and dentist office is different. Each proprietor has a certain flow they want to achieve, some have a certain theme they want to present for children or adults. It’s our complete understanding of these desires and needs of our customers that we use in our creative process of design. We begin by meeting with you, our client, to understand what your building needs are. We can then answer any questions you have and even provide preliminary plans or estimated cost. FREE! We will guide you through the entire process. “From Concept to Completion”, we are here to make your building experience an enjoyable one.